Need to build a website in minutes, with no experience? Find out the Zoho Sites website builder is right for you. Zoho Sites is an “instant website builder” that allows you to create visually appealing websites in minutes using an intuitive drag-and-drop tool. No experience is required. You can even create your site for free and get free hosting as well. There are three upgrade options that provide additional features such as basic e-commerce tools. Note: if you have purchased any of Zoho Corporation’s other software suites, you already have access to Zoho Sites. Is it Easy to Customize My Zoho Site? Conclusion: Is Zoho Sites Right for You? You don’t need any web design experience or technical knowledge to build your website. You start by selecting a design template from Zoho’s collection. All of the design templates are responsive, or mobile-friendly. That means your site will look good on any screen size or device, including smartphones. Using the drag-and-drop editor, you can customize your template to reflect your business’ needs and your design preferences. The themes are all professionally designed. Rest assured: your efforts won’t look amateurish. Zoho Sites has numerous time-saving features that will make your life easier after your site launches. For example, if you create an online store and need to make frequent updates to products (pricing, models, etc), all you have to do is create the update in the database. All pages on your site that feature that product will automatically update. If you’re creating an online store, not just a web presence for your brick-and-mortar business, you can easily add basic e-commerce features and integrate with useful apps. For example, some Zoho Sites packages include a product gallery, where you can list the items for sale. You can connect your site with PayPal so that your customers can check out easily and securely. The included multimedia tools, such as slideshows, image optimization, and support for videos allow you to leverage a variety of visual marketing techniques to showcase your products. Zoho Sites gives you unlimited file storage and bandwidth, so you never have to worry about running out of space or your site being unavailable due to heavy traffic loads. Many site builders, especially those that are free, offer you their services in exchange for being able to place ads on your site. Often you don’t get any input on the ads that are shown on your site. For users of the free version of this website builder, the only space you give up is a small spot in the footer of your website. That’s where the Zoho Sites logo and a link that says, “Create a Free Website” will appear. This is tasteful and unobtrusive and shouldn’t distract any of your visitors. While we do say Zoho’s logo and motto is unobtrusive, you may have a different view. Should you feel like you cannot deal with this so-called pitfall, you may need to find a way around it. For some users, this could act as a form of distraction from their brand. Signing up for a free Zoho Sites account is as easy as providing an email address and password. 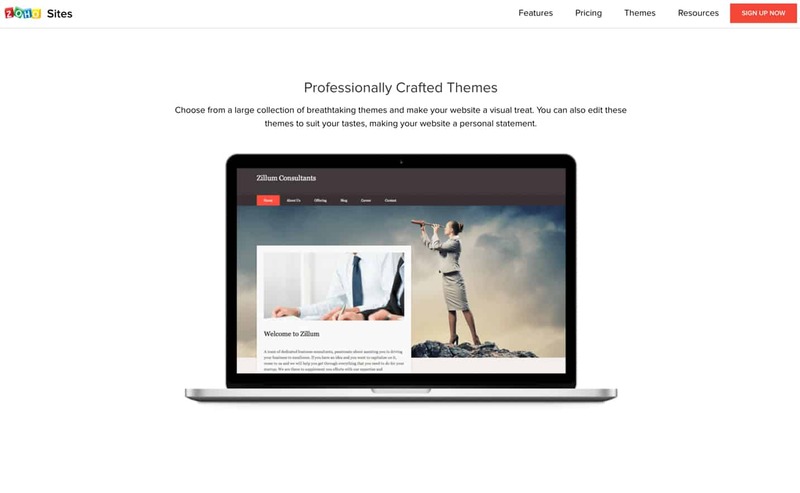 You’re immediately redirected to the themes page, where you can choose your design template. Video above: This Zoho video provides a helpful overview of how to use their sitebuilder. There are over a hundred themes from which you can choose from, and despite the presence of a section for responsive themes, Zoho does claim that all of their themes are mobile-friendly. Zoho Sites is easy to use thanks to its simple drag-and-drop interface. Yes. Once you’ve chosen your theme, you’re led to the drag-and-drop editor where you can customize your theme according to your tastes and website objectives. Whether you change just the images and text or you do a complete overhaul, you can do so easily. At the top of the editor are four tabs: elements, forms, apps, and commerce. The elements tab lets you do things like adjust your fonts, change your layout, add images and multimedia features, and create new pages (called tabs) for your site. The forms tab is where you would create online forms to collect contact information from your visitors. Options include a newsletter subscription sign up page or a Contact Us page. When creating a new form, you can use one of the pre-built form templates, alter a provided template, or create one from scratch. If you’re creating a basic contact form, you have the option of embedding the name, email, phone number, and comment fields directly onto your site. You can access the data you’ve collected from the form in the Manage > Contact Manager > Form Data area of the site builder. If you have another tool for handling this data, you can export your data to import into your data management suite. With an upgraded site builder subscription and a subscription to Zoho’s Customer Relationship Management (CRM) suite, you can use the site builder to build forms collecting data that gets fed into your CRM system. Getting contact information from interested site visitors is critical for your marketing success. So take time to think creatively about what you could offer a site visitor in return for their contact information. The Apps tab is a plus: it lets you integrate your site easily with social media, payment services such as PayPal, APIs such as Google Maps, and more. Note: you may not have access to a specific feature, even if it appears in your toolbar if you haven’t upgraded your plan from the free version to the appropriate paid subscription. For example, the free version does not allow you to add comment boxes or PayPal integration to your site. The Commerce tab is where you would list or manage the details regarding the products you’re selling (if you’re building an online store). While users of all plans can see this area, you can only use this feature if you’ve upgraded to the Professional version of Zoho Sites. When you’re done building your site, you can preview your site by hovering over the green Publish button in the top right corner. Curious what your site will look like on tablets and smartphones? You can preview that as well. By default, your site is not added to search engines. You’ll need to register your site manually with search engines before it can be found. If there are any pages that you don’t want to be indexed, you can set the robots.txt file for that page to hide the results from Google. While using Zoho Sites doesn’t require any knowledge of HTML or CSS, those who are acquainted with either of these languages can use the HTML/CSS editor to further customize an existing theme, add custom code, and personalize a site. Engaging with your customers is easy with Zoho’s support for blogging and social media. You can easily embed a blog onto your site. This allows you to create blog posts and engage in two-way dialogue with your visitors via the comment box feature. Social media integration makes it easy to push updates to Facebook, Twitter, and LinkedIn pages. If you’re looking to get started with email marketing, you can utilize Zoho Sites’ forms feature to create beautiful and functional forms to gather sign up information from your visitors. Get a free subdomain (such as yourSiteName.ZohoSites.com). If you’re using the free version of Site Builder, your site will run on the free ZohoSites subdomain. To serve your site using a custom domain, you’ll have to upgrade to a paid Site Builder plan. Zoho Sites offers dynamic content management, which means that as soon as you update something and publish your site, it is live right away. However, if you ever need to unpublish something, you can do so with just a few clicks. 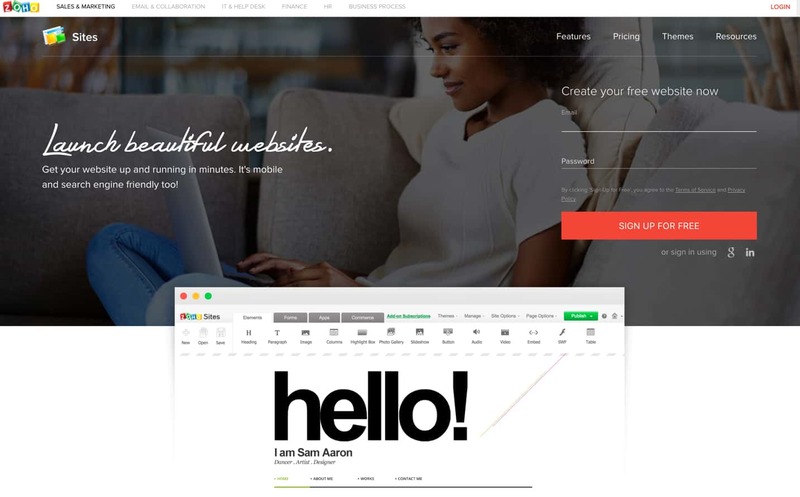 One benefit of the premium site builder subscription is that it allows you to revert to an earlier version of your site at any time since Zoho Sites automatically backs up each of your pages. Use Google Analytics to get insights into your visitors, traffic patterns, content performance, email marketing, and e-commerce. Access Google Search Console (formerly known as Webmaster Tools) to monitor your site and diagnose any issues you might see. Zoho integrates nicely with Google’s enterprise product, G Suite, so you can minimize the number of logins that you need to manage. Using your Zoho Sites account, you can create up to five websites (you can purchase a license to build additional websites on annual bases). All users can create an unlimited number of pages, allocation of storage space, and galleries/slideshows, a blog, support for hidden pages, two forms, two sets of dynamic content, and a limit of 10 MB per file. In addition to the features you get with the free edition, you get to use a custom domain with the site you built, no ads, you get 301 redirect service so that old site URLs (if you have them) lead to the related new page url, and support for other dynamic features and three more forms. Your storage limit also goes up to 100 MB. On top of the features that come with the free and basic versions of the site builder, you get the ability to use SSL certificates (though you have to provide the certificate itself), support for newsletters, password-protected services, support for five additional forms, and an additional webmaster account. At the top of the list is the professional package, which gets you everything in the free, basic, and standard versions. However, the biggest additions that you get with the Professional package are e-commerce features. In addition to PayPal integration, you get a member portal and the ability to display up to 25 products. You’ll also get additional support for more authors, ten additional forms, and additional dynamic content. When purchasing a subscription to the site builder, you have the option of paying on a monthly basis or a yearly basis. However, if you to pay upfront for an annual subscription, you’ll get two months free, regardless of the plan you choose. If you’re unsatisfied with the package that you’ve purchased, Zoho will work with you to resolve any issues you’re facing. However, if that’s not possible, they will give you a full refund within the first 30 days and downgrade you to the free service so that you don’t lose your data. If you’ve purchased an annual subscription, Zoho Sites offers a 45-day money back guarantee. Additionally, if Zoho ever removes, breaks, or discontinues functionality that was available when you signed your contract (regardless of whether it’s a monthly contract or an annual contract), you can contact them to receive a pro-rated refund for the remainder of your contract. You can downgrade your subscription at any time from the Zoho accounts area. Hidden in the middle of Zoho’s Terms of Service is the clause that says that your account must remain active. Otherwise, they’ll delete your account. While they do not define specifically what “active” means, Zoho deleting your account means that you will lose all of your data. Zoho Sites has staff offering email support 24 hours per day, five days per week. For critical customer service issues, they also offer telephone support. Zoho provides a care center for various support queries, packed with quality information. They promise to respond to all support tickets within 24 hours. You can escalate using an email address dedicated to escalated incidents. Zoho Sites offers unlimited bandwidth, so no matter how much traffic your site gets, it will always be available to your visitors. The company also guarantees an uptime of 99.9% excluding scheduled maintenance and updates (however, they promise that all updates and maintenance periods will be publicized in advance). Zoho Sites is a small portion of Zoho One, which the company claims can be your one-stop-shop for all things digital: sales, marketing, accounting, communications, and so on. Essentially, Zoho offers a variety of products that it bundles together in different ways to meet the varying needs of its customers. As a small business, such packages might be of interest to you, especially if you want a specific set of features that you want to function well together (and you are not interested in shopping around to build your own digital bundle). For example, Zoho recommends that customers use Zoho SalesIQ in conjunction with Zoho Support, the customer support solution. While Zoho may not offer the bells-and-whistles of major competitors (like Salesforce), Zoho offers solid solutions, likely at prices that are more palatable to a small business. Furthermore, Zoho, as a smaller company, may be friendlier and less confusing to use than its major competitors. Already using Salesforce? There’s nothing to say that you can’t add Zoho products to your portfolio. You may not get the integrations offered to those who stick with one brand umbrella, but you can choose the options that are best for you — maybe Salesforce offers a better product in one area, while Zoho leads in another. Generally speaking, Zoho recommends that all its customers utilize these three products together. Zoho CRM (which stands for customer relationship management) is a full suite of tools that assist with your marketing efforts. You’ll be able to store and manage your contacts, track your communications, manage your outreach programs, and more. Think of this as your tracking solution for your customized marketing efforts. Zoho SalesIQ offers live chat functionality that comes with built-in analytics. You can then proactively engage with your website’s users while gathering data on them, including their location and which pages they view. If you reach out to your customers via email (or you would like to), Zoho Campaigns is an email marketing service that allows you to manage your mailing lists and create, send, and track the effectiveness of your emails. There is much more than Zoho offers, so your best bet would be to speak with a representative to create a customized package for your business. If you are in the market for a drag-and-drop website builder, Zoho Sites is not your only option. Here are some alternatives that you might consider – but first let’s compare them to some basic expected functionalities as opposed to our expectations on the back of Zoho. Squarespace might be one of the most well-known, drag-and-drop website builders in the market right now. The company is known for its top-notch support, beautiful templates, and easy-to-use editor. Downsides? Its cost tends to be higher than its competitors, and there aren’t really options for those looking to build a more heavily-trafficked or resource-intensive site. Wix offers all-in-one website building services, as well as custom services to help you get off the ground. For example, its AI tools can help you design a website (all you have to do is answer a few questions about your business and brand and provide links to your social media profiles). If you want to get started, but find the process overwhelming, Wix might be a good choice for you. Weebly offers a wide range of website-related services. You can get started with a free website, or you can upgrade to a full e-commerce site. The company offers many different options for you to build the site you need, and there are few downsides to opting for Weebly. Zoho Sites is a solid site builder that lets you create mobile-friendly, professional-looking websites in just minutes. Its easy-to-use drag-and-drop editor means that you don’t need any design experience or technical knowledge. You can start today. Zoho has removed any obstacles that might keep you from realizing your website vision. Special features like the HTML/CSS editor allow those with some technical skills to customize the appearance in a granular way. Zoho Sites may be a good choice for those new to site building. If you’re on a budget, you can’t go wrong with the free version of Zoho Sites. You do give up a very small amount of real estate at the bottom of your site to display the Zoho logo and a link to their product. Also, your site can only be reached with a Zoho Sites affiliated subdomain. However, for just a couple of dollars a month, you can remove both restrictions, making your site appear more professional. Those who opt to pay upfront for an annual contract can save a bit since you’ll get two months free. However, for those who are looking to do more than building an online presence for their business and open up an ecommerce store, Zoho Sites might not be the best option. While the company’s higher-tiered subscriptions offer some e-commerce features, such as PayPal integration and a product gallery where you can display up to twenty-five items, Zoho Sites does not offer enough. You don’t get a dedicated checkout process, and Zoho Sites does not support integration with a majority of the payment processors in existence (save PayPal, but like we previously mentioned, this feature only comes with the top-tier Professional account). Furthermore, if your product catalog exceeds twenty-five items, you won’t be able to display all of them. With all that said, businesses who are looking to sell just a few items, such as a small selection of business-branded paraphernalia, can still give Zoho Sites serious consideration when it comes to site builders. Finally, while Zoho Sites boasts an unlimited allocation of disk space and bandwidth for your site, their Terms of Service indicates that the company may limit your usage if they feel that you’re abusing your resources. The company does not define what this behavior might consist of, but this clause is certainly something to consider if you’re interested in building what will become a popular site. Previous: Sitey Review: They Claim To Be D.C.’s Most Popular Site Builder, but Will It Work for You? Next: PageCloud Website Builder Review: ‘The World’s Best’? We Decided To Find Out.